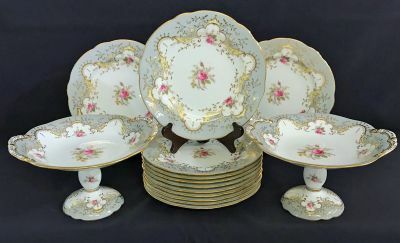 Coalport bone china dessert service, English, circa 1920. Pattern # 8978. Made for William Junior Ltd., 332 Yonge St., Toronto. William Junior was known for having fine quality china and glass. The set is comprised of 12 dessert plates and two pedestals. The plates are 8 3/4” in diameter. The pedestals are 9 1/4” across the handles, 5 1/2” high. There is a small hairline crack at the base of one pedestal.